This is a comforting, healthy chicken veggie soup with chicken, potatoes, carrots, onions, celery, and Napa cabbage that your whole family will love. It’s exactly what you want to be eating if it’s cold outside or you’re sick. Don’t be afraid to add in veggies you like or experiment. 1. Hit the ‘’Saute’’ button on your Instant Pot. Saute the minced onion and minced celery and cook until the onion is translucent. Turn to “Off” setting. 2. Add in the baby carrots and chopped potatoes. Wash the Napa cabbage or kale. Rip off the stems (kale) and tear the leaves. Add on top. 3. Remove all the skin and fat from the chicken thighs or drumsticks and place on top. Make sure to leave the bones on. Add in the 2 boxes of broth and the 2 teaspoons of chicken bouillon powder. Put in the 2 handfuls barley. 4. Make sure the steam release valve is in the ‘’Sealing’’ position. Press the ‘’Soup’’ button to begin cooking. Do not make any changes to the pressure. Make the half box of pasta according to the box instructions if you will be adding pasta to your soup. Drain the pasta. 5. After it cooks for 30 minutes it will go to LO. When it goes to LO 10 or it has been on low for 10 minutes, hit the “Keep Warm” setting. Open the steam valve and allow it to release the pressure. You may want to put a paper towel over the steam valve so that it doesn’t spray. Carefully and slowly open the lid when the steam is done releasing. 6. Using tongs, remove the chicken bones and return all chicken meat to the pot. Stir well to mix all the flavors. 7. Taste the soup and season with salt, pepper, Italian Seasoning, and Cavender’s Greek Seasoning. Do not over salt as the soup is actually pretty flavorful by itself. Serve immediately. 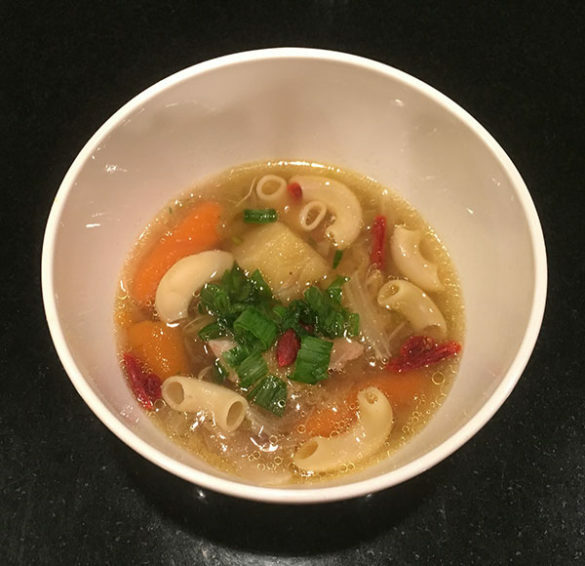 If desired, put pasta in each bowl of soup, and top the soup with fresh minced green onion and gogi berries. * If you wish to make this stew vegetarian, simply substitute vegetable broth for chicken broth and substitute the chicken with tofu or any kind of meat substitute. *You can cook pasta separately if you wish to add it. Keep it on the side and let each person add as as much pasta as they want. If you throw the noodles in the whole pot of soup they will absorb too much soup. * I like using Napa cabbage but you can use kale or any leafy vegetable. * You can use maybe 2 more thighs or drumsticks if you are using an 8 quart Instant Pot. * To make this soup without an Instant Pot first saute the onions and celery in the bottom of a large soup pot on medium heat. Then add all other ingredients and put the lid on the pot. Cook for around an hour and a half to 1 hour 45 minutes. You can rest the lid on chopsticks if you wish to let out steam.